These large aerial Heartless use their potent ice breath to attack their prey. Strike their wings and tail to force them to land, then focus attacks on their head, which is weak against Fire. 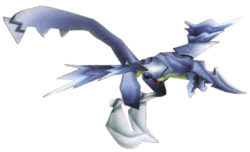 The Avalanche is an Emblem Heartless that is found in Kingdom Hearts 358/2 Days. It is one of the bosses at Twilight Town and Neverland. An Avalanche is a large, draconian creature with predominantly white and light steel blue skin, save for its belly, which is pale green. Its body is rather thin, while its feet are quite large and somewhat resemble clogs with tips that curve upward. Its wings seem rather short and have a rough, jagged appearance. They also seem to be segmented, each segment alternating from white to steel blue. The Avalanche's tail is long, wide, flat and sports a few short spikes on its sides, as well as a dark grey, zig-zagging stripe near its tip. Its forehead sports a large horn that curves upward slightly. It has beady yellow eyes on either side of its head, and its Heartless emblem is on its chest. The Avalanche's name refers to its ice-based attacks, as an "avalanche" is a large mass of snow, rocks, or similar materials that falls from a great height. Immediately Lock-On to it at the start of the battle and use a Fire Spell. This should deal a great amount of damage. Attack with the Keyblade a few times, and the Heartless Boss should plummet to the ground, stunned for a short time. Attack the beast until it awakens. Once it recovers, the Avalanche will attempt to stop Roxas with a variety of attacks. First flying a short distance away and then landing with a shockwave, the Avalanche will then fly low to the ground in a straight line, dealing impact damage if Roxas fails to dodge. It should be noted that both of these attacks can be blocked through use of the Guard ability. Attack whenever possible, but be careful as it will then shoot homing balls of ice at Roxas and Xion. These deal heavy damage, so stay far away. Bring as many healing items as possible into this battle. Make use of Roxas's Limit Break. Concept art of the Avalanche. This page was last edited on 1 May 2018, at 18:55.